Here’s a sketch of my salt and pepper shakers. Grady gave me these beautiful dishes several years ago and I LOVE them. Each set (a set includes a dinner plate, bowl, etc.) has a different theme and scriptures to go with that theme on the dishes. Some of the themes are: family (so the dishes in that set has scripture to do with family), prayer, salvation, faith, praise, love, God’s promises, wisdom, etc. The pepper shaker says, “Season your words! 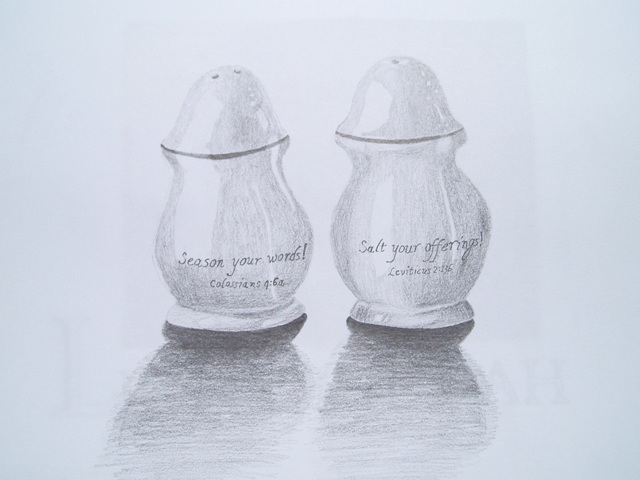 Colossians 4:6a” and the salt shaker says, “Salt your offerings! Leviticus 2:13b”. This one is very simple in design but very powerful in it’s message.